Name it whatever. I am going to use iSCSI to make it easier to identify from my others. The next screen choose your version, basically whatever the minimum version of the hosts participating in your DvSwitch is the version you should choose. I’ll go with 6.5.0. Now the number of uplinks. This is how many physical NICs each host will be contributing to this distributed switch. For redundancy, I will use 2. 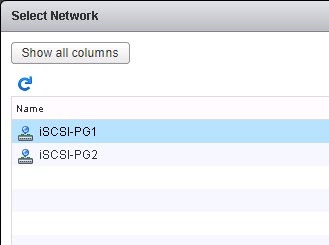 I will give the port group the name iSCSI-PG1. Now you will see a new DvSwitch created, with an uplink object and your port group(s). Now depending on how many physical NICs you mean to add to your iSCSI initiator configuration dictates how many port groups you need. 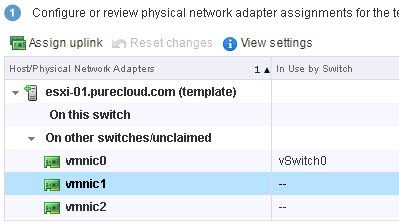 This is due to the fact that your vmkernel adapters, when used with iSCSI, must be connected to one and only one physical NIC. 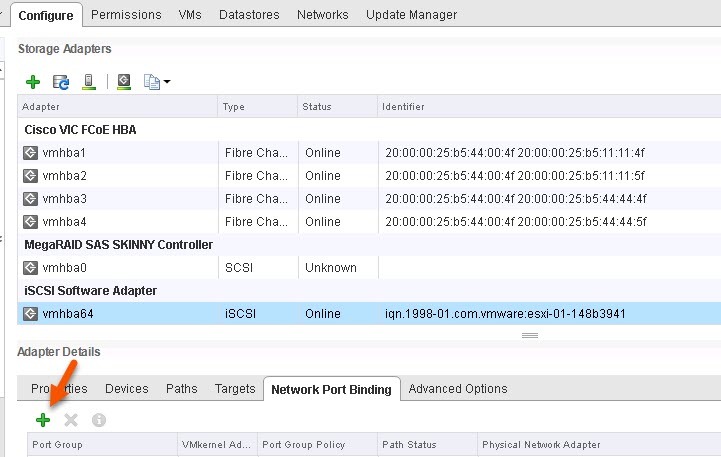 In DvSwitches, this vmkernel port inherits the physical NIC configuration of the port group. 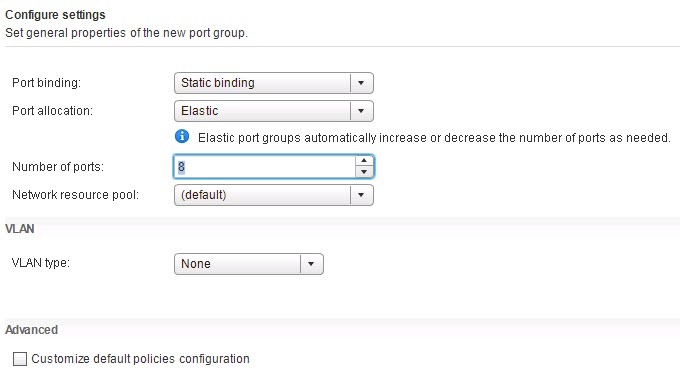 Therefore, for each NIC, add one port group. I plan on using two NICs, so I need to create one more port group (since the first wizard creating. 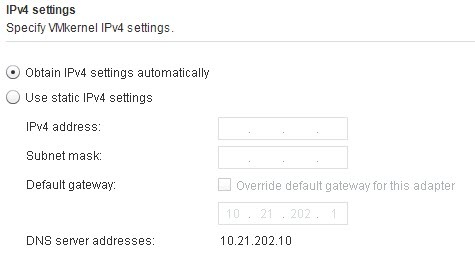 If you have a special VLAN you can add it here. Next we will add the hosts. Note that this step and the next can be done in one wizard, but for the sake of understanding I will split them out. If all of your hosts are the same (hopefully they are) you can select the template option below. For large environments (lots of hosts) I highly recommend using this option. I will follow this. If your hosts have different configurations then you will need to not use the template mode. The process is basically the same, except you need to repeat the process for each host and choose each NIC etc and vmkernel adapter individually. Tedious at best. Another reason to try to keep your compute configuration homogeneous. 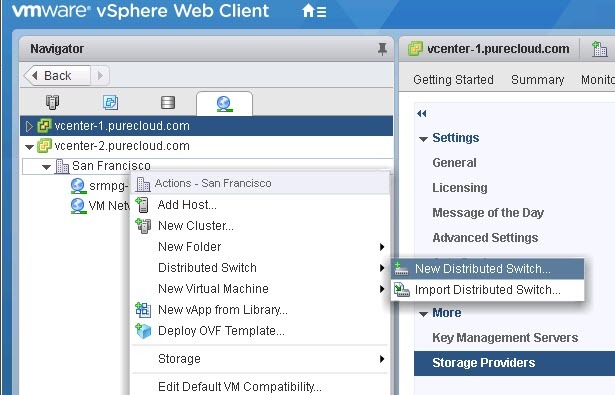 Now either choose auto-assign uplink, to have vCenter choose which uplink to assign to that physical adapter, or pick one yourself. Do this for each NIC/uplink pair on that first host. This will apply the same NIC/uplink config to each host. The next step, is vmkernel creation. Since I am using template mode, I will do this on one host and then use the wizard to propagate the configuration to the other hosts. So select your host and choose “New adapter”. This takes you through a familiar wizard for creating standard vmkernel adapters. 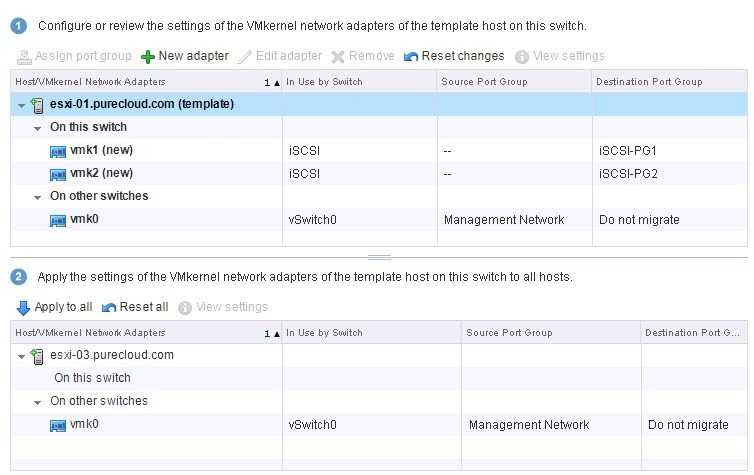 You will now want to choose browse and choose a port group from the DvSwitch to associate the vmkernel port to. 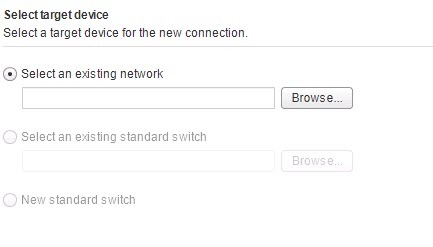 If one does not show up, it means you deselected that option when creating the DvSwitch. Go back and create one if so. 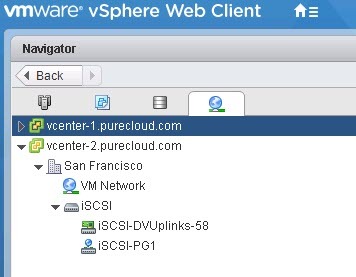 Remember I named my first PG “iSCSI-PG”. Click next. If you want additional services to use this vmk, choose them. Otherwise, click Next. The vmkernel ports will be named vmk1, vmk2 etc. automatically. In the next screen, choose the IP info. I will choose the default DHCP. Enter as appropriate. Once the template host is done, choose “Apply to all” to copy the config to all other selected hosts. You probably understand now why using the “template” mode is a good idea. If your hosts are all the same, you just have to do this once, instead of once per host. Saves A LOT of time. Now analyze the impact. If nothing is being moved from something in use, you should be green. If something is impacted, triple check what is going on. But no IPs. They didn’t get a DHCP address. In my case, this is due to not having a VLAN configured, as my DHCP server uses the VLAN 2202. Furthermore, my port groups access all of my physical NICs (and therefore its vmkernel adapters), but software iSCSI requires that all of the vmkernel adapters only have 1 active NIC and zero standby. (see info on this requirement here) Any others must be unused. So that needs to be changed on the port group. Both of these things are configured on the port group. 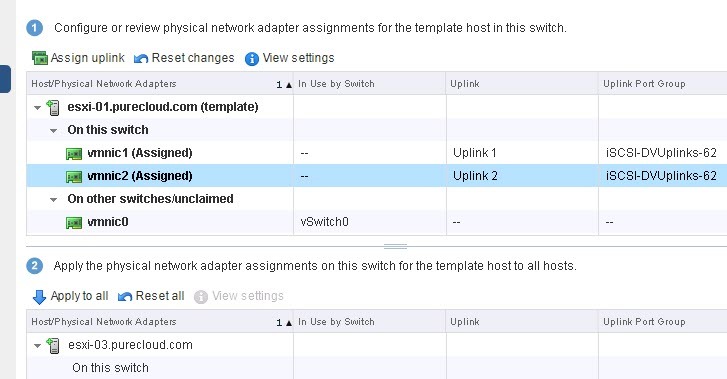 NOTE: Of course, if you are not using VLANs you can skip the VLAN part, but you do need to follow the steps for NIC binding. This has two uplinks (physical NICs). Move all but one down to unused. Each port group should have its own active uplink. 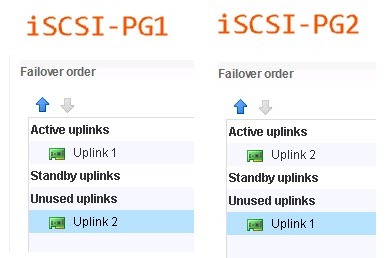 So my iSCSI-PG1 will use uplink 1. iSCSI-PG2 will use uplink 2. 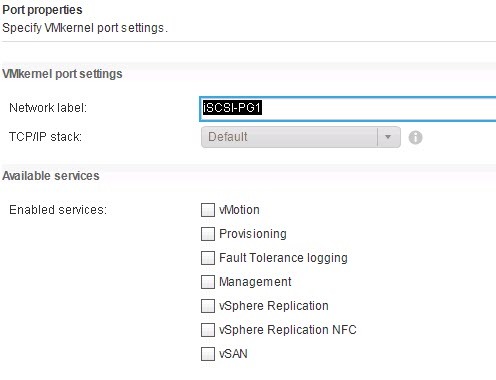 Do the same for your environment, ensuring each port group intended for iSCSI uses just one uplink and it is uniquely used by that port group (in other words, it is not set to active for another port group also intended for iSCSI).